Fleas are one of the biggest problems any pet owner has. Once your pet has fleas and has brought them into the home they get into the carpets, couches, and even into the beds causing bites and irritation to you, your children and pets. For those of you who don’t wish to use chemical insecticides on their pets, or throughout your home, here are five more flea home remedies to try out to keep fleas out of your home. Firstly though – be sure to check out our previous post on flea home remedies, as the diatomaceous earth flea remedy and the homemade flea trap in that post are two of the most effective of all the flea home remedies you can try. That said. When using natural remedies, more often than not, you’ll want to combine several natural remedies for maximum protection from fleas. My advice is make the diatomaceous earth remedy your main focus, but then experiment by adding in some of the other home remedies until you find what works best. This herbal flea powder contains a beneficial mix of herbs that effectively repel fleas. It is made using an equal portion mixture of dried rosemary, eucalyptus leaf, fennel, yellow dock, and wormwood. Crush these herbs together into a powder and gently rub them once or twice per week into your dog’s fur. This form of deterrent is more of an add-on preventative measure rather than an eliminator. I recommend growing some mint in your garden for a constant supply of mint leaves. The mint leaves can then be crushed to release their fragrant oils and placed in the usual flea hiding places throughout the home – replace the leaves regularly. Mint is known to be an effective flea repellent and will keep your home smelling fresh! Cedar oil and lavender oil are both excellent deterrents for fleas, but it is not recommended to apply these essential oils directly to your pet as they can irritate the skin. Instead, simply take 3 to 5 tablespoons of water and place in a bowl. Place about 5 drops of either lavender or cedar oil into the water. Mix it in until it is completely combined with the water and soak a bandana with the liquid. Tie it loosely around the neck of your animal and you have a natural flea repellent collar. Re-soak the bandana in the mixture every few days, and it can be used over and over again. Remember, do not tie the bandana too tightly. It needs to be able to slip off over your dog’s head if he gets it stuck on something. 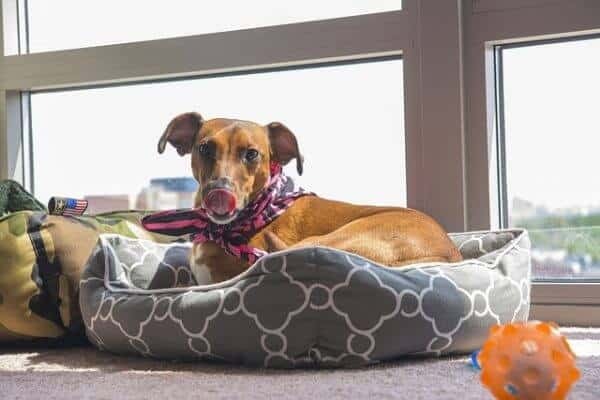 If you are concerned about your dog catching the bandana collar and getting stuck, why not sew on a button or a popper and attach the bandana this way for a quick-release collar. Flea prevention these days comes in a wide variety of topical treatments as well as some ingestible medicines. The ingestible flea treatments tend to only be available at the veterinarian offices and can be very high priced, but there is a natural solution… This remedy calls for the addition of apple cider vinegar to the dog’s drinking water. The ratio is 1 teaspoon for every quart of water. It may take a bit of time for the dog to get used to the slightly different flavor, but once they do, many owners report this is an excellent flea prevention home remedy and your dog will also likely enjoy healthier skin from the nutrients of the vinegar. Bathing your dog is essential to keeping them healthy and happy, but generic dog soap does not do anything to help prevent fleas. If you are among the many who give their dog a weekly bath, try this remedy. The mixture calls for ½ cup lemon juice, 2 cups warm water, and ¼ cup baby shampoo. Mix these three ingredients together and place in a bottle. Wash your dog once each week with this mixture to keep fleas at bay. If you feel you have a flea problem in your garden and your pet is getting reinfested when he/she goes outside, check out our recent post about how to make a garlic yard spray for fleas. This garlic spray is very effective as it disrupts the breeding cycle of the fleas. Fleas may be among the biggest pests, but that does not mean that they should be allowed to take over your world within your home. Your pets are precious and should be flea treated regularly to keep them healthy and happy. It is not essential to spend a fortune on flea treatments. These remedies, and the flea home remedies in our other post, will keep your pet healthy and happy throughout the year.